If you're looking for a unique, historical and slightly creepy experience, pay a visit to the Lost Dutchman State Park in Apache Junction, Arizona. Located just 40 miles east of Phoenix in the Superstition Mountains, you'll enjoy scenic desert vistas as you explore ancient Native American caves and dwellings, all while learning about the legend of the Lost Dutchman's Mine. The mine is rumored to exist on these grounds, serving as a relic of the great gold rushes of the 19th century. According to legend, the mine is cursed, and several people have died searching for the lost mine, rumored to be chock full of treasures, ranging from the famed lost Apache gold to untouched gold veins, ripe for the taking. The park entry fee is $5.00 per vehicle or $2.00 per person on bicycle. You can camp overnight in the park in designated campsites for $15 per site. There are no electric outlets at the campsites, however sanitary facilities are available. The State Park Service offers guided hikes through areas of the park for a modest $5.00 per vehicle. The hikes range in difficulty from easy to quite grueling, and explore areas of the park that are a bit off the beaten path, but promise scenic desert mountain views, as well as history, wildlife, and discussions about the legends in the Superstition Mountains. 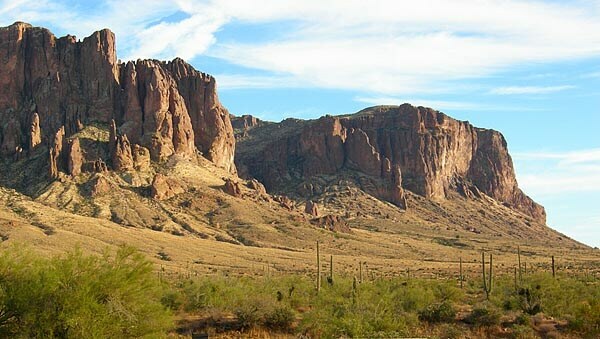 The Lost Dutchman National Park is a beautiful sight to see and experience, but go quickly! Due to budget constraints, the Arizona State Parks Board voted to close the park. The park is scheduled to close on June 3, 2010. And while you're visiting Apache Junction, make sure you don't miss the Superstition Mountain Museum. Last updated by Jennifer Mason on 18 May, 2011 in Destinations. Most states, and the federal government, are having a cash crisis for parks, and many are being 'closed'. That normally means visitor centers, car parks, etc are either completely shut or no longer maintained. Yeah, it's tragic at times, but then again, I can understand as the cost for some of these is pretty massive and visitors are very few. I agree, sounds like Scooby Doo! "Superstition Mountains", "the legend of the Lost Dutchman's Mine"? It sounds fascinating but how heartbreaking thsat they are closing it!!! What a pity - it sounds like something straight out of a Scooby Doo episode!